What’s the best budget gaming mouse? 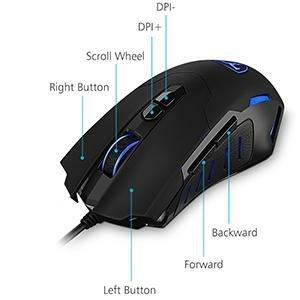 According to Amazon, the PICTEK Gaming Mouse has been ranked in the top 3 for gaming mice for quite some time. Is it the attractive price tag of around $15? Possibly. Does it have cool programmable LED lights? YES. All of the buttons are ergonomically placed and feels good to the touch. You can also customize 5 DPI settings (ranging from 500DPI to 7200DPI). A lot of users like how well the mouse fits in their hand and how lightweight it is. You seriously can’t find another mouse in this price range for all of these features. With over 1200 reviews and 4.5 star rating, you can’t go wrong. If you need to buy a Christmas/Birthday present for that one nerdy friend of yours, I’d pull the trigger.